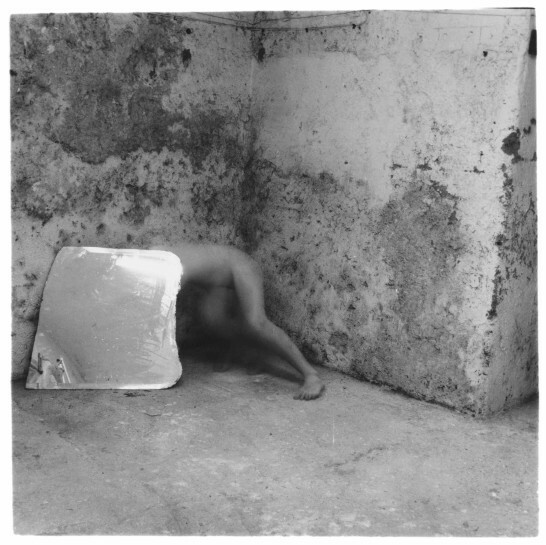 The short life of photographer Francesca Woodman has been picked over obsessively in the 37 years since she died. It is inevitable that her suicide at 22 years old colours responses to her work, but it is unusual how much it has come to define her as an artist. Of course, there are some grounds for this interpretation. Woodman’s images, the majority of them self-portraits or of models who closely resemble the artist, use long shutter exposures and silvery monochrome to intensely dramatic effect. Naked women fade into puffs of smoke, transform into tree roots, blend into walls, evaporate under bright sunlight. A quest for erasure can be read into every frame, but does this recalibration via hindsight give a balanced insight into Woodman’s world? A new show at Victoria Miro Venice strives to expand perceptions of Woodman’s artistic interests with an exhibition of her Italian Works. Francesca was fluent in Italian, having gone to school near Florence for second grade and spent summers at her family’s holiday home in Antella, Tuscany. It was in Italy that George Woodman first gave his daughter a camera. Between 1977-8, she spent a year in Rome studying at the Rhode Island School of Design’s European Honours programme. The images collected here, mostly taken from her year of study, show an art student blending her own preoccupations with inspiration from her new city and surroundings.